The Roe Park Resort is set in the stunning parklands of the Roe Valley, adjacent to the beautiful and historic Roe Valley Country Park. 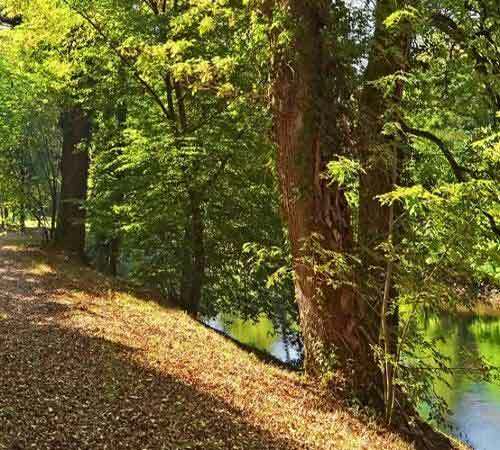 The Roe Valley Country Park stands on the outskirts of Limavady, running three miles along the banks of the River Roe, and offers spectacular riverside views and woodland walks as well as trout and salmon fishing, canoeing, wildlife trails and rock climbing. There is also a visitor centre and tea room, named after the local inventor J.E. Ritter, who established Ireland's first hydro-electric power station on the site (and was also a previous owner of the manor house around which the Roe Park Resort was built). Perhaps most enticing however are the open forest areas and parklands which visitors are welcome to explore.